The future is not what we commonly believe it will be – it will not be about technology taking over jobs, but about how jobs will be reconfigured and how these reconfigured jobs will influence or demand newer human skills or require individuals to learn new skills to remain employable. We’re at a critical juncture. Each year brings in more disruption — newer capabilities, newer tech, new jobs that are emerging that we couldn’t have imagined a few years ago. From Tesla and Uber looking for “automotive occupant engineers” to Amazon hiring for “culinary product developers”, there’s no dearth of ‘never known before’ job titles, descriptions or possibilities. And with all this comes the requirement of newer skills, competencies, and aptitudes. Organizations are moving towards more dynamic labor pools and new employment models which are in turn changing the ways in which talent is procured and assembled. With all this, workflows too are changing to absorb the modern worker and adapt to their never known before expectations. And no matter the sector, the best companies continually reinvent themselves by figuring out how to make everything and everyone work together and move on from just backfilling today’s needs. 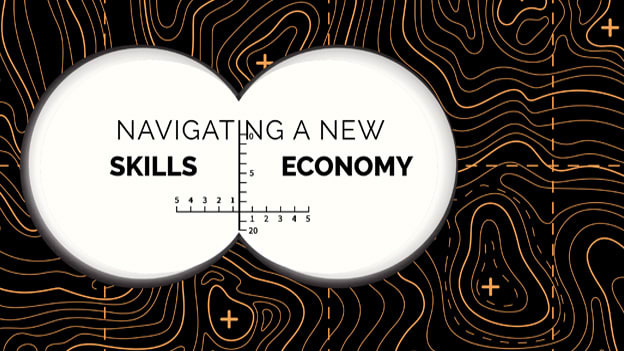 So what does it take for organizations to navigate the new skills economy? What are organizations doing to adapt and thrive in this new environment, develop talent as a differentiator, drive innovation and transform business?